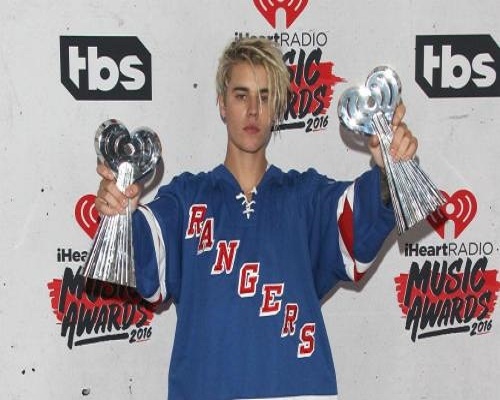 Justin Bieber has thanked God for his iHeartRadio Awards win. The ‘Sorry’ hitmaker – who went on a spiritual break last year – scooped the Male Artist of the Year accolade at the glamorous event, held at The Forum in California last night (03.04.16), and believes he owes a lot of his recent success to his faith because it has helped him turn his life around. He then finished up by praising his family for their support before admitting he hates that his career drags him away from his half-siblings Jazmyn, seven and Jaxon, six. And his tear-jerking acceptance speech wasn’t the only thing that stole the audience’s attention as he also had people up on their feet when he took to the stage to perform his hit ‘Love Yourself’ before treating them to his new single ‘Company’. The blonde pop star may have had a busy night on his hands but he still managed to make time for former Spice Girls singer Mel B’s four-year-old daughter, Madison. Justin crouched down to the youngster’s level, wrapped his arms around her and posed for a photograph with her. And it wasn’t just Madison he won over as Mel, 40, called him “the best” as she shared the sweet shot online.